Conventional loans by Fannie Mae and Freddie Mac are available to a wide range of consumers in order to fit multiple situations. If you have great credit and a bit of money saved up, it is likely that one of these conventional loans is perfect for you. People that qualify for conventional loans can typically qualify for the Fannie Mae HomeStyle Renovation Loan. They will need to make a small down payment which is a percentage of the value of the home after repairs have been made. This means that one loan, at a very attractive rate, can be used to purchase an existing home and make a wide variety of repairs. This loan will allow people to buy a home either for their elderly parents or for their college aged kids. The loan does not require the borrower to live in the home. Instead of putting money towards rent, families can buy a home and build equity to either profit when they sell the home or later use it as a rental property. For people that wish to invest in property, a conventional loan is currently the best alternative. The rates will be extremely low and with the requirement of at least 20% down, there will not be any private mortgage insurance to pay. For first time buyers of an investment property, their income will need to be high enough to cover their existing debt as well as the new mortgage payment from the investment loan. For people that currently have either a Freddie Mac or Fannie Mae mortgage, it may be possible to refinance the loan even if the property value has decreased. The Home Affordable Refinance Program (HARP) makes it possible for people that have paid their mortgage on time for the last 12 months to refinance to a better interest rate and save money on the overall mortgage. Fannie Mae HomeReady® is aimed at helping families that have income levels in the low to moderate range. This program is offered by Fannie May. The credit guidelines are a bit more lenient compared to a traditional conventional loan. In addition, there is only a small down payment requirement. If one of the borrowers is a first time buyer of a home then the down payment could be as low as 3%*. This mortgage can even be used for multi-unit properties if the borrower plans to live in one unit and rent out the remaining units. Home Possible® Mortgage is aimed at helping borrowers that have income levels in the low to moderate range. This program is provided by Freddie Mac. The credit guidelines are a bit more flexible than the traditional conventional loan. Borrowers are only required to pay a small down payment requirement. If one of the borrowers is a first time buyer of a home then the down payment could be as low as 3%*. The Home Possible® Mortgage can also be used for multi-unit properties if the borrower intends to live in one unit and rent out the remaining units. 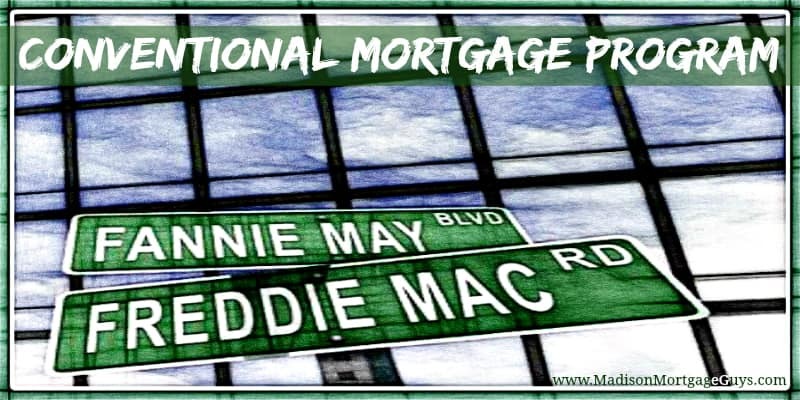 For borrowers that are not able to pay a 20% down payment but would rather avoid paying Private Mortgage Insurance, there is the Lender Paid Mortgage Insurance (LPMI) product. The mortgage is offered with a slightly higher interest rate. In exchange the lender pays the mortgage insurance for the entire loan. Often times the total mortgage payment under an LPMI loan is less than the mortgage payment for a loan that has private mortgage insurance. An interest only mortgage is a unique type of loan. For a set period of time, the borrower is required to pay only the interest portion of the loan payment. This set period can last from 1 to 5 years. At the end of the set period the borrower will begin making full payments on the loan. *3% down payment on $250,000, 4.000%/ 4.815% APR, 740 FICO, 30-year fixed rate mortgage. Mortgage insurance is required. Rates subject to change. Subject to credit approval. At least one borrower must be a first time home buyer. Borrowers who have not held interest in a property in the last three years are also considered first time home buyers. HomeReady® is a registered trademark of Fannie Mae, Home Possible® is a registered trademark of Freddie Mac.